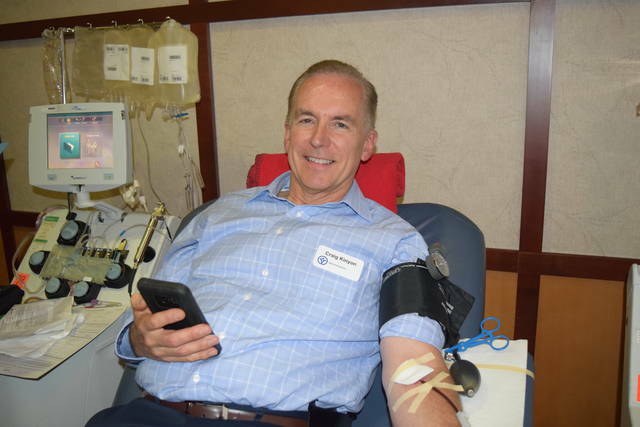 Reid Health President and CEO Craig Kinyon has been a frequent whole blood donor at the Reid Health blood drives. He made his first plasma donation when Reid began apheresis in May and was back donating plasma again at Tuesday’s blood drive before July 4th. He said giving blood can be called patriotic. RICHMOND — Reid Health never sleeps. Patient care continues non-stop through holiday time, and the same dedication continues for Reid’s blood drives. The fuse was burning on the eve of Independence Day celebrations as donors calmly filled the beds July 3 for the community blood drive in Lingle Hall. Reid hosts six blood drives a year with Community Blood Center. In May of 2017 the Reid Health blood drive expanded hours to a 7:30 a.m. to 6:30 p.m. schedule to accommodate more community members. In May of 2018 CBC began using apheresis machines at Reid for platelet and plasma donations. Reid Memorial Hospital began its blood service partnership with CBC on Feb. 10, 1974. Over the years Reid Health has been a welcoming home base for CBC. Director of Laboratory Services Chuck McGill has served as blood drive coordinator for more than 30 years and staff members regularly juggle their shifts to donate. Community members have embraced the Reid blood drive schedule. Family members Linda Pease, Kathy Wagner and Diana Glunt come from different towns to donate together at Reid. “We go out to eat lunch first then we come here,” said Diana. Reid blood drives draw the support of loyal donors like Gary DeLucio, who made his milestone 100th lifetime donation Tuesday, and Eric Marshall who made his 150th. https://www.registerherald.com/wp-content/uploads/sites/41/2018/07/web1_Reid-CEO-Craig-Kinyon-donating-1-.jpgReid Health President and CEO Craig Kinyon has been a frequent whole blood donor at the Reid Health blood drives. He made his first plasma donation when Reid began apheresis in May and was back donating plasma again at Tuesday’s blood drive before July 4th. He said giving blood can be called patriotic.